These food-themed pre-wedding shoots are a must-see for all your foodie couples out there! These couples dedicated their pre-wedding shoot to their one true love - food! Like most couples, they wanted a pre-wedding shoot before the big day too, but unlike most of them out there, they did something completely different. 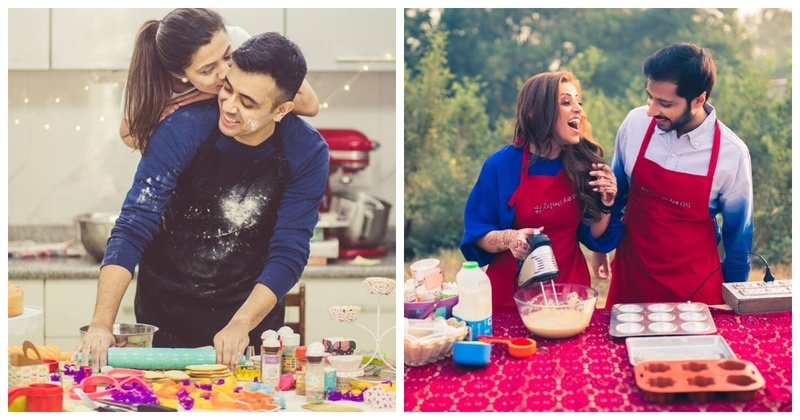 This couple decided to dedicate their pre-wedding shoot to baking! Yes, these cuties baked together some really cute cakes and cookies and I for one, am in love with this colourful pre-wedding shoot! This couple decided to do a food-themed pre-wedding shoot in the middle of a forest and here’s saying it’s one of the quirkiest pre-wedding shoot I’ve ever came across! I mean just look at how adorable they look! Love is being able to cook together! This is a pre-wedding shoot of 2 foodies who love food as much they do each other! Every picture of this pre-wedding shoot signifies special moments the couple has spent in each other’s company. Every restaurant, every food joint has a memory attached to it. From the humble litti chokha to the expensive frappuccino at Starbucks, they’ve captured it all! Well, are you salivating too? Because I sure am! Well well, I hope now you know what pre-wedding shoot you wanna plan for!